Working at a construction job in Naperville, Illinois can be a dangerous occupation. Anyone at the construction site that is negligent on the job and fails to follow safety protocols can jeopardize the health and well-being of everyone. Many accidents with severe injuries and fatalities occurring on the job site could have been prevented had everyone received adequate training and education on remaining safe in the workplace. Injured victims and surviving family members who have lost a loved one in a construction site accident are legally allowed to file for benefits and seek compensation from all those who caused them harm. However, successfully resolving injury and wrongful death cases are complex. To resolve the case quickly and receive appropriate compensation, the victim must seek out legal assistance from experienced Naperville construction worker injury attorneys who specialize in premises liability, personal injury and wrongful death cases. A lawyer working on your behalf can seek sufficient compensation to recover medical expenses, time off from work, funeral expenses, pain, suffering, and mental anguish. Rosenfeld Injury Lawyers handles construction site accident cases across Illinois. If you or a family member was injured on a construction project in or around Naperville, contact our attorneys for a free case review. Bridge Replacement Project – Local city officials approved the Downtown Washington St., Bridge Replacement Project that will dramatically affect the North Route into the city. The road crosses over the DuPage River and BNSF railway tracks. The 40-year-old structure is in need of replacement because many of its components have deteriorated. In recent years, the city has restricted the size of trucks and cars that can utilize the bridge to extend its lifespan. Ogden Avenue Resurfacing Project – The Illinois DOT has begun resurfacing Ogden Avenue beginning at Raymond Drive up to Interstate 355. While the project was initially started during the summer of 2017, construction was shut down during the winter months. Naperville-Plainville and 95th St. Intersection Project – The Will County Division of Transportation is expanding the 95th St. and Plainville/Naperville Road intersection by reducing two lanes to a single lane during the construction process. Ogden Avenue Water Main Replacement – Naperville residents traveling along Ogden Avenue are expected to deal with the Water Main Replacement Project. Many business owners along the construction route expect to see a dramatic decline in sales and challenges to operation until the project is completed. The nearly $680,000 water Main reconstruction project will replace the current water delivery pipe that is significantly poor condition. The project is expected to minimize ongoing breaks in the system. Raymond Drive to Interstate 355 Resurfacing Project – The Illinois Department of Transportation will manage the resurfacing project along 7 miles of the road in June. Project managers expect the job to be completed before winter. Naperville, Illinois – Police began an investigation into a construction zone death that occurred at Naperville Central High School. The custodial worker's body was located at approximately 7:45 AM at the bottom of a deep pit that was part of the school’s new construction project for the addition of an academic wing. An ironworker at the construction site discovered the body of the 45-year-old Aurora, Illinois female worker before notifying the site supervisor and calling the Naperville police. Streamwood, Illinois – The body of a 22-year-old construction worker was pulled from the utility hole of the sewer during a rescue mission that lasted over four hours. The employee had been working on a sewer line in Streamwood adding fiberglass lining by spraying the material inside the sewer pipe. First responders were called to the scene at Parkside Circle and Park Blvd. in October 2017 to begin a long rescue mission. While the operation began at 6:15 PM that evening, the man’s body was not pulled from the sewer pipe until approximately 10:00 PM. The firefighters were unaware that the man was dead until he was extracted. Completion of the investigation could take many months. Joliet, Illinois – In April 2017, a Lake in the Hills construction site worker was killed in a construction accident in Joliet, Illinois. The 33-year-old died from an apparent neck incision wound that was the result of a “workplace mishap." The accident occurred at the 1100 block of Vandyke Road. Initial reports indicated that the injured worker was transported from the construction site to present St. Joseph Medical Center just after 9:00 AM, where he was pronounced dead. OSHA (Occupational Safety and Health Administration) is investigating the incident. 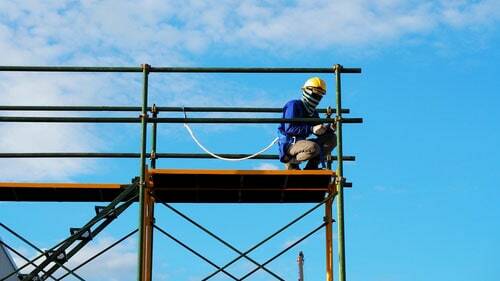 Have you been injured at work or lost a loved one in a Naperville construction site accident? If so, you are likely entitled to receive financial compensation for your damages and losses. Injured victims can file worker’s compensation forms to obtain some benefits to cover medical expenses and time away from work. Surviving family members can file wrongful death lawsuits to hold those responsible for the loss of their loved one both legally and financially accountable. However, these cases are complex and often difficult to resolve. An attorney working on your behalf can help determine if you are receiving all the compensation and benefits legally available to you and your family. Contact Rosenfeld Injury Lawyers at (888) 424-5757 to speak with a reputable attorney today who specializes in wrongful death cases, construction site accident, personal injury and premises liability claims. Our team of Naperville construction accident attorneys working on your behalf can ensure that you receive adequate compensation to recover your medical expenses, lost wages, loss of future earnings, funeral expenses, burial costs, mental anguish, emotional distress, pain, suffering and other losses. We offer a free, no obligation case consultation. If we are unable to secure compensation through a jury trial award or negotiated out of court settlement, you owe us nothing.